What are you trying to achieve? Are you still trying to achieve this? Do your short-term goals align with your long-term plan? And does the long-term plan align with your values and principles? What did you do in the last month to achieve your goals? What did you want to do, but failed? Are there any goals which you want to achieve in the next month? This is especially helpful in today’s dynamic environment. Things change, your situation changes, your wishes change. This is why it is important to make time for a monthly reflection. A month is a relatively long period of time. Think about it – 28 to 31 days, 4 to 6 calendar weeks, 20-22 working days. Whole projects can be completed in 4 weeks and whole initiatives can fail. Going back to my advice before – make your weeks rock and then every month make sure your weeks rock in the right direction. My personal story here is relatively simple. I have structured my life around principles. My journey started years ago after reading the book “Principles” by Ray Dalio. He describes his life and devotes the whole second part of the book to the principles that govern and have governed his decisions. Also, in Stephen Covey’s “7 Habits of the Highly Effective People”, the author teaches us how building your life around principles leads to the highest efficiency of our time. Going back to my example. I invested a lot of time to formulate my principles and I started following them. To a certain point. A few months passed and I caught myself reverting to old habits. Then, I had another principle-building session. I congratulated myself about the things that were going in the right direction and corrected the others. And finally, I would set some principles on which I wanted to concentrate in the upcoming weeks. I found myself reducing the period between these “reflections” as I started calling them. And I finally settled to a monthly cadence. This means 12 reflections a year and it means that at most 4-5 weeks can pass before I catch myself going in an undesired direction. As always, here are a few practical steps that you can take to start doing these monthly reflections. A principle is “a fundamental truth or proposition that serves as the foundation for a system of belief or behavior or for a chain of reasoning.” Your principles form your belief system and govern your life. Whether you like or not, whether you realize it or not. The first and foremost step is usually the hardest. Do not look at this as a task, but regard it as an archeologist who methodically uncovers a fossilized dinosaur skeleton. You can rush it and risk to break or lose something. Or, you can do it gradually, getting the most benefits. Also, do not think about this as defining your principles. I would rather say that principles are based on your values. And you need to uncover them. As Viktor Frankl says in this book “Man’s Search for Meaning”, you do not ask life what your purpose is, but rather life asks you this question and you have to answer it every day. As you uncover, formulate, and re-formulate your principles, you write them down. Ever since humanity has invented writing, it remains the best possible way of keeping information. Your brains are not so good at remembering things, especially words, your brains are way more suited to remember feelings and emotions. This is why you write words down. This is also important because the actual words matter. Amazon’s S-Team (a group of senior leaders reporting to Jeff Bezos) took months to formulate the company’s 14 Leadership Principles. And to this day there have been numerous iterations and alterations to improve the wording. For example, “Think Win/Win” is a good principle, but “Always interact with people from a Win/Win or No Deal point of view” is even better. From time to time, go back your principles and read them. Go back to them when you are in a difficult situation. Use them to make decisions. But most importantly, review them before doing your monthly reflection. Be open-minded. Some principles may need better formulations as you learn more about them. Some principles may merge into one. And other may split into two or more. You may uncover additional principles. Or find others that you want to change. As always, if you do not book time for something, if you do not have a reminder, you are most likely to forget it. I am personally using my to-do process and I have a recurring monthly reminder for my monthly reflection session. When the time comes, I block one or two ours on my calendar to do that. What are the things that you did exceptionally well this month? To which principle does that relate? This helps you uncover the behavior that leads to the best results so that you can analyze and copy it to other processes and principles. If you can add stories, anecdotes, or specific feedback fro other people, that will be great. Once again, write this down so that you can get back to it in the future and review what you have written. What did you set out to achieve but didn’t? Did you decide to emphasize on something but failed to schedule time for it? Write these down so that they hurt. This will increase your motivation to tackle them in the following month. But do not overdo it. There is no use in punishing yourself endlessly. Do you see any patterns in this month compared to the last few ones? Are you systematically avoiding to develop a skill, to have a conversation, or to set something up? If you see something like this, create a plan on how to tackle it? Even better, formulate a goal around it. One possible outcome is that your principle or desire does not correspond to your values, so you can remove it. 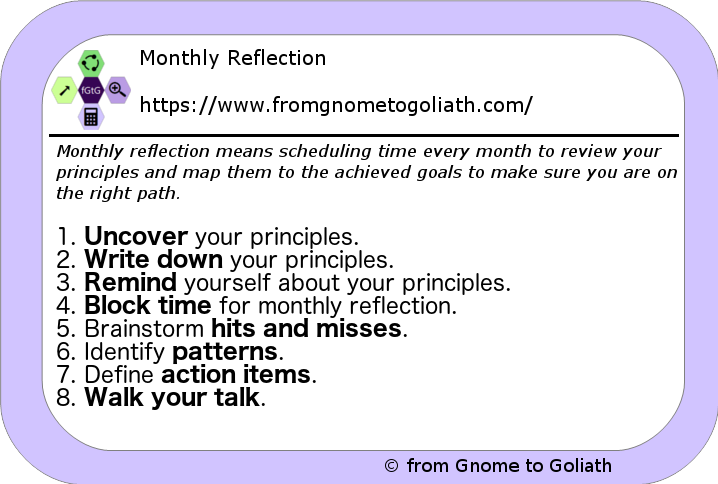 Define several action items based on your monthly reflection to concentrate in the next month. These will become your short-term goals for the next month. Write them down. Review them every week as part of the First Things First process. Did you act on them? No matter what you uncover, formulate, or set yourself to do, do it. Obviously, the main benefit of this process when you act on it. Otherwise it is just another paper (or electronic) document. Basing your life on principles and aligning your goals to them is very beneficial. Uncovering your principles takes a lot of time and dedication. It helps you stay true to yourself and your values. 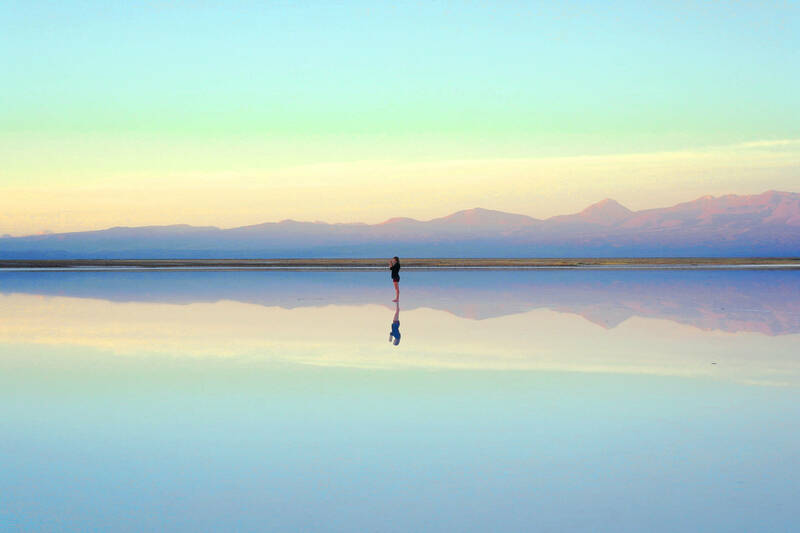 Monthly reflections are a powerful tool for making sure you stay on the right track. Doing this exercise month over month increases the quality of your goals, improves your results, but most importantly leads to better self-awareness.